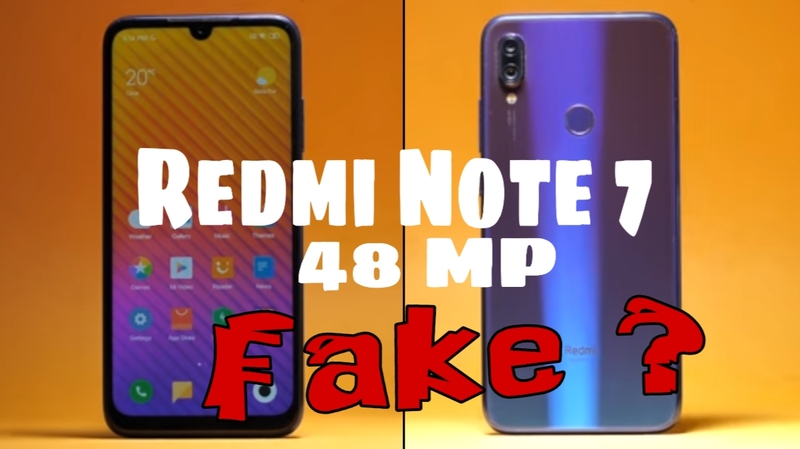 The most controversial thing about the redmi note 7 is the 48 megapixel camera some say it's fake some say its innovative some say it's a gimmick but nobody actually has the redmi note 7 well we have it here so let's reveal the truth. But before we get started I suggest you to subscribe this blog the to get notified every time we post an awesome new blog like this one now that you've done that. 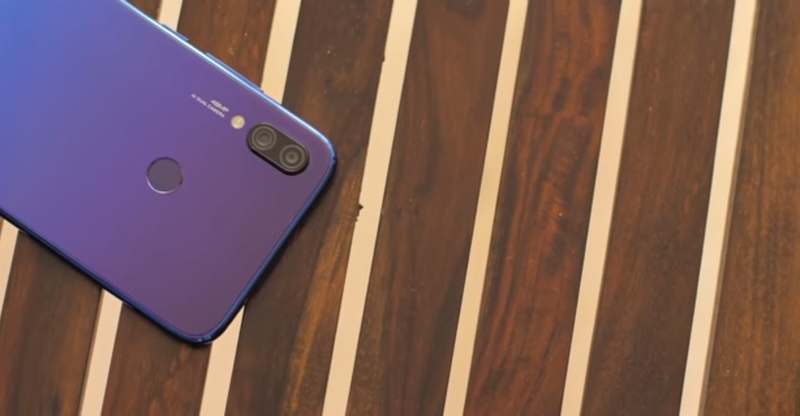 Let's talk about the redmi note 7 - 48 MP camera so here is the new redmi note 7 and it has a 48 MP camera on the back it is Samsung's 48 megapixel isocell bright gm1 sensor and even xiaomi brands it as a 48 megapixel camera so where exactly is the doc well start so, let's start with whether the note 7 truly has a 48 megapixel sensor the ISO seulji and one sensor in the up. 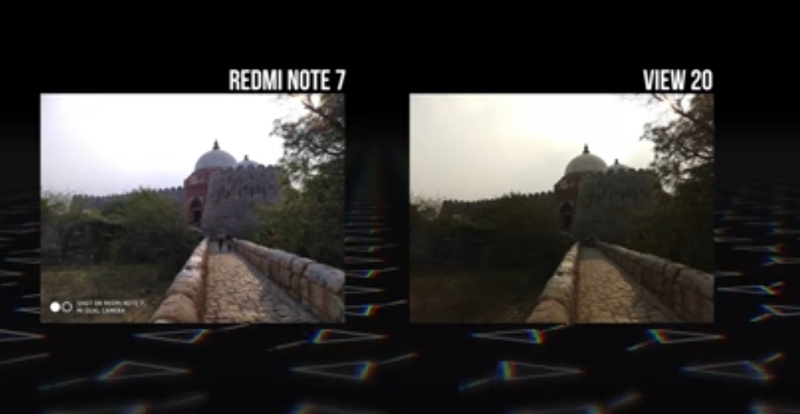 Redmi note 7 is a 48 megapixel sensor but it's a little more complex than that check this out this is how pixels are arranged on a camera sensor now the pixels themselves can't capture color which is where a bear filter comes in this is basically placed over the sensor with each pixel being dedicated to a single color only there will be 25% red pixels 25% blue pixels and 50% green pixels the ISIS lgm1 sensor however doesn't use a typical Bayer filter Samsung uses tetra-cell technology which is very similar to pixels binning and here's what it looks like so instead of overlaying RGB on single pixels the GM one basically uses a single 2x2 area of pixels for capturing red light another 2x2 array for capturing blue light and two 2x2 arrays to capture green light so the sensor does in fact have 48 million pixels but since 4 pixels are technically combined to capture one color the final output is an image of 48 divided by 4 that's 12 megapixels. 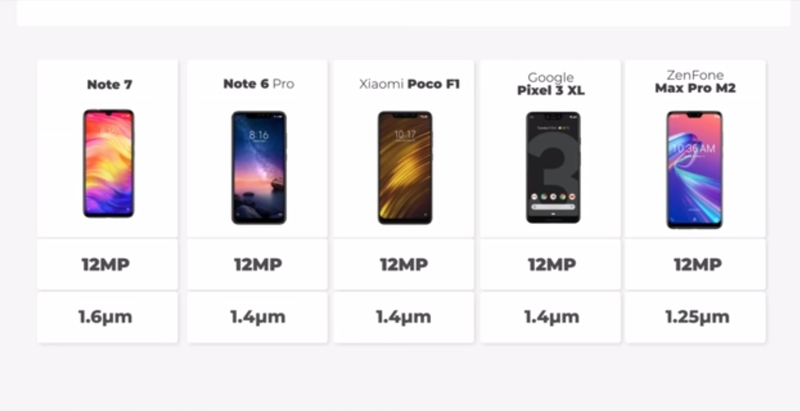 Which is clearly within the snapdragon 616 capability and that's the reason why the camera in the note 7 only supports 12 megapixel images in the auto mode even the various specs apps show the camera specification on the redmi note 7 as 12 megapixel so yes the redmi note 7 ISOs lgm1 48 megapixel sensor does not support 48 megapixel output natively even though it is a 48 megapixel camera sensor so what's the advantage of a forty eight megapixel camera is it a gimmick fitting up whopping 48 million pixels on a tiny smartphone camera sensor means that the pixel sizes are really really small in fact the pixels in the gm1 sensor are just point eight microns however. 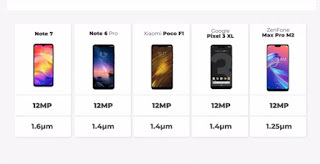 Tetris and technology are pixel binning combines 4.8 micron pixels to create one large pixel of 1.6 microns and well the pixel size is the more light it can capture which means brighter low-light photos here's how the note sevens 12 megapixel pixel size compares to other two element pixel phones when it's clear that the pixel size of the note 7 in 12 megapixel is bigger than the pixel size in even flagship moves like the pixel 3 so technically the note 7 should be able to capture some great low-light shots but these are just numbers let's see how the redmi note 7 camera actually performs in low-light so here's a low-light photo from the redmi note 7 redmi note 6 pro zenfone max pro m2 and the pork we're phone since a lot of you guys wanted us to compare the note 7 camera with the pork we're fine so as you can see that redmi note 7 photo here is pretty good although. 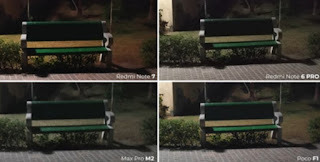 The the poco everyone's photo is just brighter let's zoom in on the chair and you'll see that the details on the note 7 photo are really good anyway here's another comparison it was really dark when I took this and while the redmi note 7 photo is bright it's not very sharp and this is where the poco f1 is just way better here are some more comparisons and it's clear that the redmi note 7 takes pretty good low-light shots that are better than the note 6 pro and the max pro empty yes. 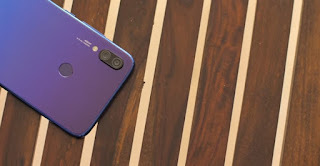 Sometimes the colors are often the redmi note 7 photos and sometimes it's just inconsistent but it mostly captures photos that are bright and sharp and that's good enough if you're wondering how it fares against the poco f1 it's clear that the poor f1 takes better shots now let's compare it to the pixel 3 to see if the 48 megapixel camera can match up to a high-end 2 L megapixel camera here are a couple of comparison shots well there's a lot of difference I mean that note 7 is not bad but the pixel 3 photo is obviously way better. 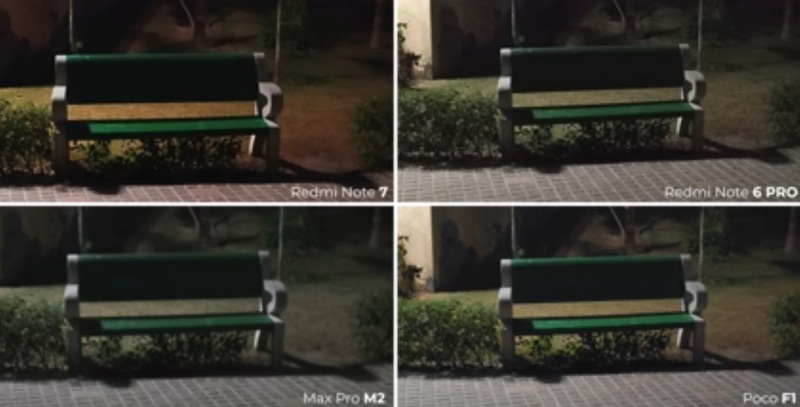 It's actually unfair but I just wanted to give you an idea that it's true really megapixels don't matter having said that the redmi note 7 for its price does have an pressive low-light camera now I'm sure you've been wondering about this the redmi note 7 does have a 48 minutes an option to capture forty eight megapixel photos in the pro mode so how does that work when the snapdragon 616 not support cameras over twenty five megapixel when the truth is it's not truly forty eight million pixels in fact this mode just captures a bunch of 12 megapixel. Photos and interpolates them to create a forty eight megapixel shot generally speaking interpolation is just a software technique which is kind of like upscaling an image so here's the forty eight megapixel mode in the redmi note 7 is just a software technique and generally interpolation is known to ruin photos but the redmi note 7 does a fairly good job of this since the note sevens camera since it actually has 48 million pixels so the iso has enough information to interpolate the image here are a few forty eight megapixel shots from the redmi note 7. In good light and you'll see that the photos are pretty good but you know there's not a lot of difference here when compared to a 12 megapixel shot from the phone take a look at a forty eight megapixel and 12 megapixel photo from the redmi note 7 side-by-side there's almost no difference even when you zoom in here's another photo and i know you can zoom in more in a forty eight megapixel photo but that's the only advantage I have found with it if you're wondering what happens in low-light well this happens the small point eight micron pixel size in 48 megapixel results in some pretty dark photos so yeah I don't think I'll be using the 48 megapixel mode on the note 7 Xiaomi has revealed that the note 7 probe will feature the sony IMX 586 48 megapixel sensor which is the sensor used by the on of u20 so how does the ISO in gm1 48 megapixel sensor in the redmi note 7 compared to the 48 megapixel Sony I MX 586 sensor in the honor of you 20 well unlike the Samsung sensor the Sony sensor has each pixel dedicated to a single color so the output from its sensor is truly 48 megapixel unlike the interpolation in the Samsung sensor and it shows in the photos take a look at few comparison shots when it's clear that the 48 megapixel photos from the view 20 are definitely better than the 48 megapixel photos from the note 7. Zooming in you can see that the view 20 is native 48 megapixel mode works better than the 48 megapixel more on the redmi note 7 well the 48 megapixel photo quality is a big difference what truly differentiates the Sony sensor from the Samsung sensor is the fact that it can dynamically switch to pixel bidding as well so right it can capture 12 megapixel photos with a larger 1.6 micron pixel size so the Sony IMX 586 sensor brings the best of both worlds and it's clear that the redmi note 7 pro should have better cameras dandy redmi note 7 i know i know that was a lot of tech jargon in just a few minutes but let me sum things up really quickly yes the redmi note 7 does have a 48 megapixel camera sensor but yes it can only capture 12 megapixel photos natively there is a 48 megapixel camera mode which honestly is kind of useless and rather gimmicky having said that the redmi note 7 camera takes some great photos photos that are better than the competition and as an end consumer that's what really matters doesn't it I mean it's not perfect and the camera here cannot take on the high-end phones but for a phone that should be priced at around 10,000 rupees the 48 megapixel camera or whatever in the redmi note 7 is something I'll gladly accept well that was everything about the redmi note seven forty eight megapixel camera. 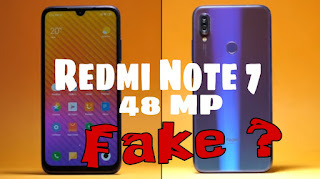 But if you still have any doubts make sure to comment below and we'll make sure to reply and yes xiaomi has a now that the redmi note 7 is coming to india very soon so stay tuned for our full redmi note 7 review also give this video a thumbs up if you enjoyed it and share it with your friends who have been confused about the redmi note sevens 48 megapixel camera.